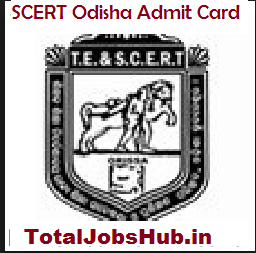 All the applied candidates must avail their Odisha SCERT Admit Card 2019 from here. Odisha State Council of Educational Research and Training is about to conduct the Entrance exam. The Authority has activated a Download Odisha SCERT D.El.Ed Hall Ticket 2019 link. Applicants are advised to follow these given updates and reach the downward section of this page to obtain the Admit Card. News Updates: Directorate of Teacher Education and SCERT Bhubaneswar, Odisha released Hall Ticket for M.Phil, B.Ed, B.H.Ed, D.El.Ed, M.Ed, Diploma in Art Education (Visual) Exam Please Download it now from the link given in the last section. The focus of the participants should be on Odisha SCERT B.Ed Admit Card 2019 at the moment. Since the authority has made it clear that those having their Hall Tickets in hand, will be the ones to appear in the state level entrance test, there should be no delay made on the examinees’ part. Kindly, refer to the following guidelines and instructions while downloading Odisha SCERT D.El.Ed Hall Ticket 2019. Also to be noted by the candidates, that those able to qualify the test, will be called for the rest of the admission and selection process. Once the exam gets conducted, the shortlisted contestants will be notified regarding the same through the council’s official website. Moreover, the details related to Entry level exam can also be obtained from the same web portal. Hall Ticket is required as an identity proof by the candidates. Examinees while entering the examination hall need to keep it in a safe possession for they may be asked to produce the same anytime. For important details like examination timing, venue details and time to report, kindly, refer to your Hall Tickets respectively. Do not bring any extra or unwanted article inside the examination hall. Use of electronic media or mobile devices is also banned inside the venue. Locate an updated link and notification on the homepage. Follow it to reach the candidates’ login page. Put your registration number and a password in the text boxes and press the submit button. Get a hard copy of the Hall Ticket generated and keep one copy in your custody. We informed all the candidates that the Odisha B.Ed Exam 2019 Hall Ticket now released. Here, you can download the scertodisha.nic.in Admit card and note down the exam center name and time carefully. Please reach the exam center on the correct reporting time. Also, Remember to take your hall ticket and an id proof with you while going for the written test.